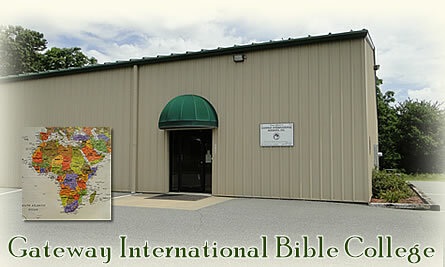 Welcome to our Gateway International Bible College Information Catalogue! We are very happy that you have chosen to investigate this brand new Christian Bible College, and we believe that if God leads you here to become a dedicated student of the Bible, that the practical studies in all of our curriculum programs will be used by God to help prepare you for a wonderful and very fruitful future in your work as a servant of God. Please know that this new school has been designed with a major emphasis on the inerrant and infallible Word of God, and all of your acquired learning experience will be with the goal of practical application in your life and in the field of ministry that you have chosen. If you are thinking of just coming here for academic information only, then you probably should choose another school. But, if you plan to come to our school to learn the Bible and related courses in order to apply the truth and information you glean from your studies in a very practical way, then this is probably the place for you if you meet our entrance requirements. Please know that we believe our new school is unique in this era of Liberal Arts and secular education, and during this age of extremes on the campuses of a lot of institutions of higher learning. These extremes may include legalism, hyper-Calvinism, extreme emotionalism with counterfeit miracles and blessings, and a lot of shallowness when it comes to Biblical truth. GIBC has been designed to study the Bible in depth with a plan to make the information learned to be used practically on the field wherever God leads you. GIBC has also been designed with the superior goal of promoting evangelism and soul-winning around the world as its major priority, and it is our sincere desire that every student will graduate from this school with an enormous love for Christ, and an enormous love for what Jesus loves; the souls of men, women, boys and girls. We truly desire that GIBC will be a beachhead from which we might launch an all-out attack upon Satan by rescuing people from his clutches and control by and through the power of the Holy Spirit and through His written Word. If this information inspires you to a new passion for the Word and stimulates you to taking the Gospel to the entire world, then this is probably where you should be. So, if you are accepted as an on campus student, or if you register to become a distance learner, welcome to the new world of spiritual excellence and aspiration. Please let us know if we can help you in any way with your pursuit of God’s will for your life! The applicant desiring admission to Gateway International Bible College must submit an application along with a $100.00 registration fee. The application must be completed as thoroughly as possible including all of the letters of reference, transcripts requested, etc. Leaving a section incomplete may result in rejection of your application. Once the application has been properly reviewed and evaluated, the administration will notify the applicant by letter to inform you of their decision to accept or reject the application. In some cases, the applicant may be called in for a further, in-person interview for additional information or explanation. Under no circumstance will a student be allowed to graduate unless the $300 Graduation Fee has been paid in full. Audit classes tuition-free, paying only for books and fees. Take classes for credit, tuition free if a Free Tuition Agreement Form has been signed by the spouse. The $100 Registration Fee must be paid at the time of application. A full-time student is one taking 12 semester hours or more. A part-time student is one taking 11 semester hours or less. Text Books: All students are required to purchase the text books for each class if required. The books will be offered by the school at the most reasonable price possible. Students have up to two weeks after the beginning of each semester to drop or add a course. To do so, the student must come by the office and pay a $10.00 fee for each course dropped and a $10.00 fee for each course added, courses dropped after mid-term examinations will carry a grade of (F) on the record. To withdraw from school a student must come by the office and fill out a withdrawal form. Withdrawal forms must be completed to officially withdrawal. A report of grades will be issued to each student at the end of each grading period, providing the financial account is up to date. Only the final grade of each semester will be placed in the permanent record file. *If transfer credit is given to any applicant enrolling in the GIBC program, the student must complete at least 36 credit hours of study with GIBC in order to complete the Bachelor of Biblical Studies Degree! These 36 hours are mandatory for every student! Students, faculty, and staff of Gateway International Bible College are to abide by the following standards of conduct. Violation of these standards will result in dismissal. One may be dismissed for any conduct not becoming of a true Christian. Dismissal will result if a student receives 100 demerits. A student must carry a minimum of 12 semester hours to be classified as a full-time student. A student may not register for more than 18 hours without approval from the Academic Dean. An average academic load is 18 hours per semester is required to graduate in four years. A semester credit hour is 50 minutes of classroom study, lecture, or lab for a period of sixteen weeks. A mid-term report card following mid-term exams. These report cards will measure student progress to date and identify areas needing improvement. The mid-term report cards will not become a part of the student’s permanent record. A semester report card at the end of each semester which shows the student’s progress for the entire semester. Grades recorded on the semester report are permanent and will appear on the student’s transcript. A progress report which shows the student’s progress toward graduation. These reports will show the semester hours completed for each area of study within the student's major. The student's cumulative G.P.A. will be indicated. The normal processing time for a transcript request is two weeks. During the Christmas holidays, the processing time may be longer. Before transcript requests can be processed, the following requirements must be met. Include the transcript fee of $10.00 per transcript copy with your request. Your account must be current with the Business Office. We realize that for various reasons, including geography, it is not always possible to attend our campus classes! This does not have to exclude you from our learning opportunities. Our distance learning can alleviate these handicaps while providing more control of when, where, and how quickly you complete your studies. This service will be of extreme value to our prospective international students. External students have access to the same resources, support, and faculty as traditional students. Our online options are flexible allowing such students to schedule classes to fit their lives and still be a part of our student body. If you would like more information about our distance learning opportunities, please contact our offices. Students are permitted to repeat courses where grades of F and WF are earned. Grades of D may also be raised, but only if the course is a requirement of their major area and requires a minimum grade of C. Repeated course entries will be followed by the letter R. Only the repeated course with its specific quality points will be used in the overall grade point average. The grade on the initial course will be replaced by a grade of R and will not be used in the overall grade computation. The forgiveness policy may be utilized only by someone working toward a degree who has taken the repeated course or courses at Gateway International Bible College prior to the receipt of his first bachelor’s degree. The student can utilize the policy only once per course and to a maximum of five different F, WF, or D courses. A student should consult the Academic Dean’s Office prior to registration each term to assure that the policy is applicable to his specific concern. Each student must demonstrate through his scholastic record that he is making satisfactory academic progress in order to remain eligible to stay in his program of study or to continue in the school. Satisfactory progress for enrollment purposes is based solely on the courses attempted at Gateway International Bible College. A minimum cumulative G.P.A. of 2.00 is expected to graduate. At the end of each semester, the Academic Dean will review each student’s progress and make specific decisions concerning continued enrollment. If a student’s cumulative G.P.A. is 2.00 or above, he is considered to be making satisfactory progress and is eligible to enroll for the upcoming semester of study. If the student’s cumulative G.P.A. is below 2.00, he is considered to be having academic difficulty and is placed on academic probation for the upcoming semester. Academic probation should alert the student that progress in his program of study is in jeopardy and immediate attention is imperative. The probationary term will be served during the student’s next term of enrollment. During this period, the student is ineligible to participate in any leadership positions in connection with the college, including traveling musical groups. Involvement in these activities requires much time and interferes with the need for study. Furthermore, the student will be limited to a prescribed academic load of approximately 12 semester hours or fewer. If the semester ends and the semester’s G.P.A. is below 2.00, he is not considered to be making satisfactory progress and will, at the discretion of the administration, be dismissed from the school. However, if at the conclusion of the probationary period, the student’s semester G.P.A. is above 2.00 but his cumulative G.P.A. is still below 2.00, he is considered to be making satisfactory progress and will be given one additional term of probationary enrollment. This extended probationary status recognizes the student’s progress, but an additional semester of study is necessary to raise the cumulative G.P.A. to the desired minimum. Students released from the college for academic reasons are eligible to apply for readmission after one semester. However, readmission is not automatic. Students readmitted after academic expulsion are accepted on a probationary basis. A minimum G.P.A. of 2.00 will be required each semester in order to continue. The probationary status will be removed once the student’s cumulative G.P.A. is 2.00 or better. Any student dismissed twice due to unsatisfactory academic progress may not apply for readmission for one academic year. Appeals of academic decisions implemented through this policy may be made in writing to the Academic Dean. The college provides academic counseling to assist students in planning their academic programs and to deal with any problems which need assistance, including determination and removal of causes for low academic scholarship. During the school year, a student may consult the Academic Dean concerning his course of study and his future academic plans. Counsel is given by the Academic Dean to assist the student in making progress toward graduation. Only credits which carry a grade of A, B, or C will be accepted for transfer credit. Courses accepted for transfer must be of comparable content and quality as those offered by Gateway International Bible College. Courses of comparable quality but not of comparable content will be accepted as elective credits. While transfer credits beyond the number required for each area of study within a major are acceptable as electives, the electives will be limited to the number required for each major. Each transfer student will be required to complete a minimum of 60 semester hours toward the Bachelor’s Degree and 30 semester hours toward the Master's Degree Programs at Gateway International Bible College. In the “Undergraduate Programs” section of this catalogue, the curriculum for each major includes the.required number of hours in several categories for completion of the degree. All students must register for classes. Registration days are scheduled at the beginning of each semester. Students living in the area may register early, but a late registration fee will be assessed to all who register after scheduled registration times. Registration is not complete until financial arrangements have been approved in the college Business Office. Students will not be permitted to enroll in any class after the second week of the semester. Consult with the Academic Dean. If a change is recommended, the appropriate form must be completed. Pay the add, drop, or transfer fee if applicable. This fee is not charged during the first two weeks of each semester. Any courses dropped during the first two weeks of the semester will not appear on the student’s transcript. Courses dropped after the second week of the semester will be given grades WP or WF. Failure to withdraw officially will automatically result in the penalties associated with the college’s policy on class attendance. Courses may not be added after the second week of the semester. Regular attendance to classes is required. A student is responsible for all work assigned, including any assignments missed because of absence. Whenever possible, a student should consult his instructor in advance about work to be missed because of a foreseeable absence. An instructor is authorized to lower the grade of any student who has unexcused absences. Excessive absences (absences exceeding four times the number of weekly sessions for the class) will result in a grade of G. Excessive absences directly related to emergency situations or extended illnesses may be appealed in writing to the Academic Dean. Students missing class on the date of a scheduled test will not be permitted to make up the test or to take it early unless unusual circumstances prevail and approval is granted by the instructor, Students failing to take a final examination sat the scheduled time will not be permitted to make up the test without written approval from the Academic Dean. Punctual attendance is expected in all classes. Three tardies will equal one unexcused absence. Students will be excused from class to allow for participation in approved college functions, as determined by the Academic Dean and/or the Dean of Students. Students missing class because of such activities are responsible for the material given during the class. Arrangements must be made for early submission of assignments due on the day(s) of an absence. Make-up of scheduled tests or quizzes should be coordinated with the appropriate instructor and will be taken prior to the scheduled date whenever possible. Absences for these functions are not counted against the student’s record for the semester. Weekly chapel attendance is required of all students as an integral part of their training. Gateway International Bible College requires every student to faithfully attend and support one of the conservative Baptist churches in the area in all the services of that church, as well as in any special series of that church. Each student is also required to participate a minimum of two hours per week in that church’s evangelistic visitation or outreach program if the church has one. All students are required to attend orientation at the beginning of their first semester each school year. Attendance at Commencement exercises is also required for all students, regardless of their graduation status. The courses in the catalogue are offered with the full-time student in mind. Anyone who is planning to attend Gateway International Bible College for only a year or two should make certain that the courses he wishes to take will be offered during the time that he wishes to attend. Gateway International Bible College cannot assume the responsibility to offer specific courses for students who plan to attend for only a short time. The college reserves the right to cancel any course that does not have sufficient enrollment to warrant the offering of that particular course. While the college will do its best to accommodate individual scheduling to meet employment schedules or other needs, courses cannot be scheduled for the convenience of individual students who cannot or who do not take courses in their regular sequence. Students must plan ahead. Detailed information about summer school courses, activities, and dates may be obtained by contacting the Records Office. Withdrawal from the college requires completion of a Withdrawal Form obtained from the Academic Dean. This form must be submitted to the Academic Dean and also to the Business Office before withdrawal becomes official. The effective date of the withdrawal shall be the date on which the student signs the Withdrawal Form or in the case of an unofficial withdrawal, the date determined by the Academic Dean once the student has exceeded the excessive absence policy described in the class attendance policy. Failure to follow the administrative procedure for withdrawal will result in a grade of F in all courses and a forfeiture of any refund.